In spite of the current global Oil & Gas price volatility there are still numerous large Exploration, Construction and Production projects in play. And even more projects in or nearing a stage of Front End Engineering Design (FEED) phase. The FEED is basic engineering which comes after the Conceptual design or Feasibility study. The FEED design focuses the technical requirements as well as rough investment costs for the project. 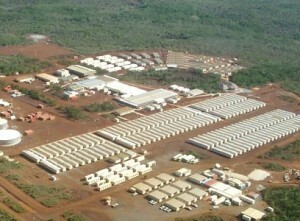 One critical component is the mammoth logistics and cost issues of these 4,000 to 5,000 person camps in typical Fly In / Fly Out (FIFO) models for onshore and offshore operations that still continue to require high touch of management and control in process and systems. During this current global business retrenchment various organizations in the Mining, Hydro and Oil & Gas sectors are reinventing how they do business. It is clear that rightsizing, lean and better IT solutions will continue to all play critical strategic parts in these industries. Operational priorities to address increasing operations costs, the need for greater productivity/efficiency and continuous improvement in safety and quality for the workforce are very high priorities. Best in class IT Solutions like Nomadis that have supported these challenges for over a dozen years in many industries have proven that “off the shelf” solutions will work. There is evidence that integrated processes to facilitate air travel, camp accommodations and various land travel (reservations to final itinerary) in a one stop shop supports inventory control, improved asset management, lean processing and thereby lower costs with reduced wastage. Continued use of IT driven workforce solutions provides the evidence in data to compare the company’s investments against budgets, invoices and even wastage/spillage. Improved processes also improve the experiences of workers. Management then has the reports and tooling to make better and more informed decisions. As the focus of on African oil and gas development expands, the involvement of helicopter fleets is growing. Download the article in General Aviation featuring Michael Nagel. Helicopters, now used extensively in Exploration and Production Services, have also become one of the most critical components of the extensive Oil & Gas supply chain. Onshore or offshore, the industry relies heavily on helicopters for daily crew changes, precious cargo and 24/7 Medevac. This includes an ever growing list of other needs and requirements to maintain business continuity and safety. Therefore, helicopters are mobilized worldwide to their Oil & Gas installations. The most frequent and safest option, for transporting aircraft valued at up to $50M, is by ocean freight in a RORO Vessel (roll-on, roll-off). This involves towing the aircraft on-board without rotor blades with re-assembly at the destination port. However, the easiest methods to get to that next operation is to ferry fly the helicopter if this is practical. Extremely versatile, helicopters can be shipped by air, sea or land. Global Oil and Gas exploration is increasing in new onshore and offshore locations with the goal to meet the insatiable appetites of worldwide energy markets. These new operations stretch the availability of the entire aviation supply chain including government operated Search and Rescue (SAR) as well as Aviation Emergency Medevac Services (EMS). New exploration projects (such as offshore operations in Canada’s Atlantic to Europe’s North Sea to the deep water operations off the Gulf of Mexico) have revealed an urgent need to address workers safety. In the event of injury or illness to the unfortunate event of a lost aircraft or vessel, these far distances offshore can take hours or even days to reach. When reading the business news it is impossible to ignore the reports of the mammoth = growth and development of the Oil & Gas sectors of Western Canada. 2014 could be a milestone year with new pipelines, the game changing LNG (Liquefied Natural Gas) terminals and more investments in the Oil Sands. Decisions made will have huge impacts for workers, communities and the aviation industry. Managing this activity has grown in complexity. Communities like Fort McMurray have not been able to accommodate the flood of of workers and smaller cities like Kitimat, may not want to. Balancing the sensitive social and economic issues with First Nations is also a huge factor. The aviation industry is key in providing solutions. Mini-camp communities now feature facilities accommodating aircraft in the ~ 150-passenger class. In Alberta, there are more than 180 airports with International Civil Aviation Organization (ICAO) designation, many operated by the major Oil & Gas companies. Skills shortages exist in Western Canada. Competition will escalate as provinces and companies compete for these resources. The “benefits” factor for workers beyond compensation becomes vitally important, like maximizing time off. Consequently, most workers now Fly in/Fly out. FIFO is the buzzword in most job advertisements sourcing technical and academic remote workers. One of the latest Tar Sands operations to recently achieve “First Oil” in Alberta was Imperial Oil with their Kearl Project now producing ~110,000 BBL/D (barrel per day) with forecasts to mirror the production in phase 2 (Kearl Expansion). In this construction phase alone, Imperial has 5000 remote workers on site per day. At the nearby ConocoPhillips construction site, this is a similar work model. Scheduled carriers like WestJet and Air Canada have identified the value by bypassing their own hubs to fly to oil & gas markets. The airlines recently announced direct flights from Toronto, Vancouver and Kelowna to Fort McMurray. While the evidence is not definitive, there are reportedly over 5,000 migrating workers just in Kelowna. “In our charter models, we strive to transport workers as quickly as possible and therefore base a Boeing 737 aircraft in St. John’s, NL.” says Hart Mailandt, Director, Business Development of North Cariboo Air. This saves valuable time for travel, improves the worker’s family time and saves the customer money. “Our research indicated that Oil & Gas clients wanted new aircraft that were more reliable, had lower noise and GHG (greenhouse gas) emissions, and could fly non-stop across Canada.” said Darcy Morgan, Chief Commercial Officer of ENERJET who launched the B737- 700 NG in 2008. “Increasing the efficiency of all resources is key,” explains Mailandt, “time is money so our charter customers want to maximize time on tools.” Aviators must deliver workers on the job site as quickly as possible. Established carriers such as Porter declared in 2013, they plan to enter Western Canada with the Bombardier Q400 and the CS 100 aircraft. Additionally, upstart carrier JETLINES also announced in 2013 that they plan to use a fleet of Airbus A319/320 to fly from Vancouver to several secondary markets. The new business segment that is “traveling for work” has higher expectations. Oil & Gas customers that use guidelines such as OPG (Oil & Gas Producers) also expect best in class principles from aircraft technology, safety and comfort. In 2013, Sunwest Aviation christened their new facilities at Calgary International Airport. Clearly accommodating customer evolution, it features ~600 parking stalls, leather lounge seating, valet car service, robust check-in and fresh Starbucks coffee. The airport in Fort McMurray adjusting to high passenger movement, has scheduled major improvements from runways to a new International Facility in June 2014. 2013 passenger counts soared to 1.2 million from 958,000 in the previous year. The Northwest Regional Airport (Terrace/Kitimat) is also reacting to the development in the region. “The forecast of huge investments by Oil & Gas companies in the region and our passenger forecasts at 200 to 500 a day motivate us to get the airport ready.” remarks Carmen Hendry Airport Manager. In 2013, the airport handled 177,600 passengers, a 28% increase over 2012. The constant state of improvement in the science of workforce logistics has helped manage the shortage of workers in mega projects around the country. Aviation, from environmental applications to providing affordable transportation, has also supported the principle of maintaining our fragile social fabric from First Nations lands to small communities across Canada. In the past few years there have been great innovations in safety, training and technology and Canadian helicopter operators and manufacturers have been at the leading edge on numerous implementations and improvements. Some of these innovations feature, the Bell 429 (glass cockpit IFR) manufactured in Mirabel, Quebec and in the future, the Bell 525 Rentless, (a new super medium category incorporating fly by wire) a strong candidate to enter the offshore Oil & Gas market with launch customer PHI in 2015. In 2013, Paul Spring of Phoenix Heliflight, was awarded the Eurocopter Canada’s Innovation in Safety Award for his lifelong promotion of Helicopter Flight Data Monitoring (HFDM) recorders. Way ahead of his time in onshore domestic operations, this feature has become a necessity for offshore operations. Cougar Helicopters, operating in the hostile environment of Atlantic Canada, have made important innovations in offshore commercial Search and Rescue. 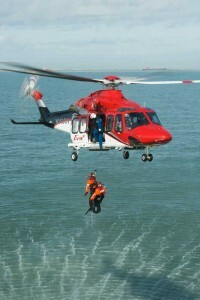 They were the first to employ the Sikorsky 92 in full All Weather SAR operation. Cougar has provided the backbone to Search and Rescue operations for numerous Oil & Gas organizations as well as supporting the Canadian Coast Guard. Gemini Helicopters offers a pilot operator with the knowledge and ability to handle two jobs; one is to fly a helicopter, and the other is to operate remote oil and gas wells that are not accessible year round by road. A innovative example of efficiency and leverage. During a typical day, a pilot operator might make 20 landings on the R44. CHC Helicopters has installed the Electronic Flight Bag (EFB) on all heavy helicopters replacing up to 40 pounds of documentation. This iPad-based flight bag weighs under a pound and a half and has all the necessary materials loaded in app form. EFB will also provide flight crews with powerful tools for routing, fuel planning and weight and balance calculations. 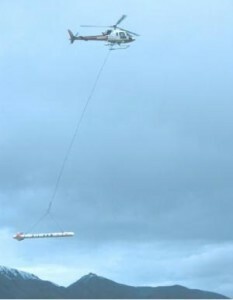 Airborne Geophysical Surveys and Exploration by helicopter-borne transient electromagnetic (HTEM) survey system (aka towing a bird) is now a very popular seismic tool in the harsh onshore/offshore terrain in Canada. Operations require highly skilled crews and management to perform this specialty helicopter flying. The Innovation theme across Canada supports and promotes a market-oriented, consumer-driven Oil & Gas industry by investing in initiatives that will improve the competitiveness, profitability and future of Helicopter applications. Pilot and Engineer Shortage – Fact or Fiction? Innovation and Technology in the helicopter industry is a function of the growth and development arising from a number of key industries such as the Resource sector (Oil & Gas, Forestry and Mining), Search & Rescue (Emergency Medical and Law Enforcement), and Military (Para and Humanitarian). These changes are influenced generally because of sector challenges, market risks, regulatory amendments and opportunity developments. Aircraft are expensive and, while using cash, to purchase a $30 million heavy helicopter is often the “cheapest” method, lease financing is a strategic form of finance that is gaining momentum. Progressive operators that are updating their fleets or increasing capacity are considering these short or long-term options to maximize their investments. Copyright © 2019 Nagel Aviation Consulting. Legal.